The Republic of Yemen is located in Western Asia at Arabian Peninsula’s southern end. With a population of 27.58 million people, it is the second-largest country in the peninsula. Yemen is home to over 200 islands, with its capital city being Sana’a. Endless beauty exists in this destination. Popular attractions include Saleh Mosque, Cairo Castle and Shaharah Bridge. Cheap flights to Yemen are now available for a limited period of time, so get ready to be amazed by this destination’s unique beauty. The city of Seiyun is home to Seiyun Airport (GXF). Due to political unrest, flights to Yemen are currently limited. Discover unique flora endemic to the island of Socotra. 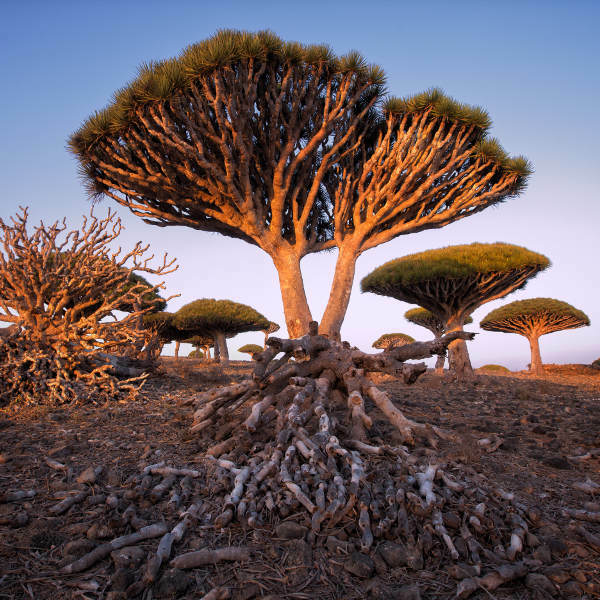 The alien-like Dragon’s Blood trees are a fascinating sight to behold. Get caught up in the ancient magic, legend and folklore of these mind-boggling trees. There are vastly beautiful ancient cities with ruins of former kingdoms. Incredible history can be traced by visiting these ancient sites, including Baraqish, Old Ma’rib and Zafar. 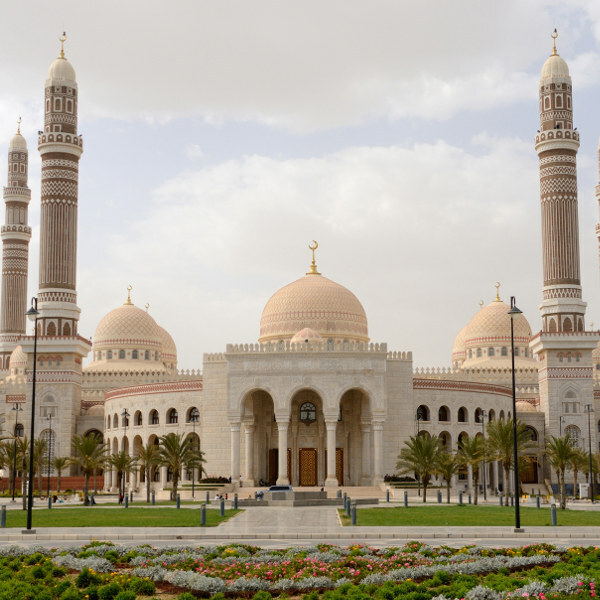 Yemen’s cities are abundant with incredible mosques. They are truly beautiful buildings with profound history. The mosques can be seen from far away in the town. The Yemeni architecture style is an amazing sight. The best time to go to Yemen depends on which region you wish to visit, because climatic conditions vary between the regions. There are three climatic zones throughout Yemen, namely the coastline along the Red Sea; the central highlands (the Tihama) described as hot and humid; and the Wadi Hadramawt in the east. The country makes up some of the most fertile area in the Arabian Peninsula. Extremely hot conditions can be felt in the southern coastal zone and Tihama. Low rainfall occurs between March and April, and between July and September. Expect average temperatures of 28°C in winter (November to February) and 37°C in summer (June to September). The best climate in the Arabian Peninsula can be felt in the Yemeni highlands. Sana’a experiences average temperatures of 25°C in winter and 30°C in summer, which is much more pleasant than the blazing hot temperatures experienced in other parts of the Arabian Peninsula. For cheap flights to Yemen, it is considered ideal to plan a trip to Yemen during September and October, and between April and May. Yemen is abundant with exquisite wonders and probably doesn’t get as much recognition and praise as it deserves. Once you have decided to make your way to Yemen, you are sure in for a pleasant surprise. It takes a brave soul to travel to Yemen in spite of its civil unrest but you will be greatly rewarded for your open-minded travel approach. Few know much about this destination and this adds to the thrill of your voyage to Yemen. The capital city, Sana’a, is situated in a mountain valley and has been inhabited for over 2500 years. The city is an important Islamic cultural centre, where you’ll find a Muslim university and many beautiful mosques. There are exquisite attractions for your perusing pleasure, including the magnificent beaches, the Old City and the Hamams (saunas). In addition to Yemen’s unique character is the “lost world “of Socotra, which is a remote island with alien-like plants up to 20 million years old. The island is home to an incredible range of around 800 rare species of flora and fauna, many are exclusively found on the island. Compare several airlines and book your cheap flights to Yemen online at Travelstart! • Take care in the Old City, as there aren’t many street signs and it is quite easy to mistakenly end up in someone’s courtyard. • It is best to walk around the cities with a local guide or security escorts. • It is encouraged for tourists to try and blend in and avoid drawing unnecessary attention. • Wear traditional clothing and do not hang out at typical expat hangouts. All travellers should be up-to-date with routine vaccinations such as measles-mumps-rubella (MMR), diphtheria-tetanus-pertussis, varicella (chickenpox), polio and yearly flu shot. Travellers are also encouraged to get vaccinations for hepatitis A, hepatitis B and typhoid.